Your favorite pasta impersonator made in the most simplest ways for a healthy and delicious lunch or dinner. Spaghetti squash is one of my go-to meals when I feel like I need a break from pasta. I love that Spaghetti Squash only takes ~40 minutes in the oven (or even less in the microwave and Instant Pot, see my directions below for those methods) and then you can just heat up marinara sauce and pour it on top with a pinch of Parmesan…mmm! I’ve also made my spaghetti squash and incorporated half of the squash with regular noodles. One of my favorite recipes to mix half noodles and half spaghetti squash is with my Roasted Tomato and Bell Pepper Pasta! What is Spaghetti Squash anyways? Spaghetti squash is also called vegetable spaghetti! Spaghetti Squash is a creamy-yellow, watermelon-shaped winter squash that was so named because of its flesh, which, when cooked turns into yellow-gold spaghetti like strands. Spaghetti squash averages from 4-8 pounds, are typically available year round with a peak season from early Fall through Winter. When at the grocery store, choose a spaghetti squash that are hard and smooth with an even pale yellow color. You should avoid a greenish squash because that is a sign of immaturity and those with bruised or damaged spots. Storage: No refrigeration required for spaghetti squash! You can store uncut spaghetti squash at room temperature (like on your counter) or in a cool dark, place for up to 3 weeks! The hard skin of the winter squash protects the flesh and allows it to be stored longer than summer squash. Eat the cooked spaghetti squash noodles after 3-5 days from cooking. Spaghetti squash is a perfect low-carbohydrate alternative to pasta. A one-cup serving of spaghetti squash has ~7-10 grams of carbohydrates as compared to ~45 grams in one cup of pasta or rice!! One cup has only ~42 calories and offers important health benefits. This is perfect for people who may be watching their carbohydrate intake, such as diabetics. Spaghetti squash provides the body with essential vitamins and minerals like vitamin A, B-vitamins, and manganese. What I like most about it is how versatile it is. Have you tried my Chicken Alfredo Spaghetti Squash yet?! I personally prefer the taste of my spaghetti squash when made in the oven, but it can also be microwaved if you do not have the 40 minutes for it to cook in the oven. (see instructions below). There are a few different methods to cooking a spaghetti squash. My favorite is the oven, then the Instant Pot, and then microwave. If you’re getting stuck on the part where you have to cut the squash in half, try these tips: score the squash with a paring knife (score where you will cut it in half) and also poke the squash around the squash in a few places with a fork, then cook it for 3-5 minutes in the microwave. Scoring will help guide the knife when going to cut in half, and poking it a few times with a fork lets steam escape. Using a sharp knife, cut about 1 inch off of the top and bottom of the spaghetti squash. Then carefully cut the spaghetti squash in half lengthwise. Scoop out the seeds, just like you would a pumpkin! Save seeds to cook and eat or discard. Spread about 1 tsp. olive oil on each half and then sprinkle with salt, pepper and garlic powder. Place cut side up (flesh facing down) on a baking sheet lined with foil. Bake for about 35-45 minutes or until you can easily poke a fork through the skin of the spaghetti squash. Remove from oven and flip the squash over and you will be able to take a fork to the squash and create your noodles! Cut the squash lengthwise and scoop out the seeds. Place the trivet down on the bottom if it isn’t already inside and then add 1 cup of water. Arrange the squash in the Instant Pot. I like to stack the spaghetti squash on top of each other, cut-side up. Close the lid and make sure the Instant Pot is set on sealing and not venting! Set to manual, high-pressure for 7 minutes. When the timer goes off, use the quick release method by switching the valve from sealing to venting carefully with a towel so you do not burn your hand! Wait about 5 minutes for the steam and pressure to dissipate. Open the lid and test the squash. Use the tines of a fork to separate the cooked squash. Take a bite to test that it’s done. (I like my squash tender but not mushy). You can always cook for another 1-2 minutes on high pressure if needed. Once the squash is cut in half and you’ve scooped out the seeds, just flip it upside down in a baking dish, fill it with about an inch of water, and microwave for 10 minutes, or until soft. Each squash may vary. Cook both halves at ones, or save the other half for another day. You can enjoy it as a side or make it into a meal with your favorite red sauce and a lean meat, such as ground turkey. 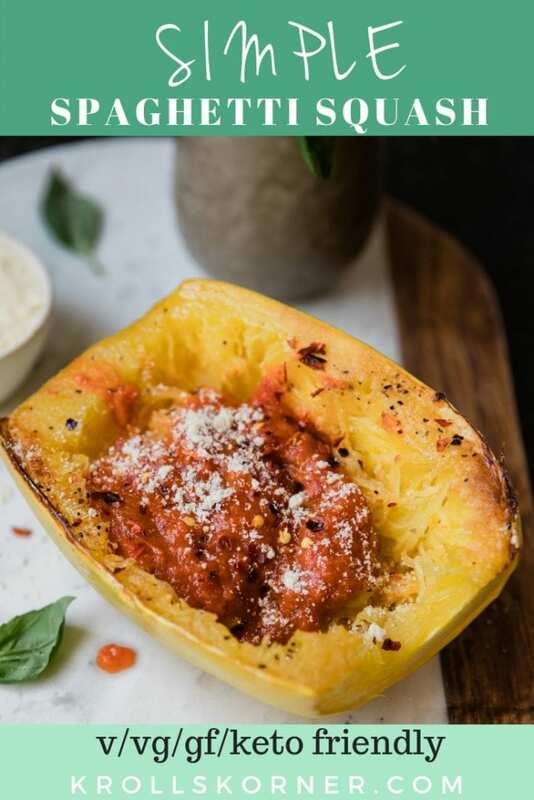 Yes, spaghetti squash is keto friendly. You’ll want to watch out for the red sauce or marinara you use, because some have a lot of sugars added into them. 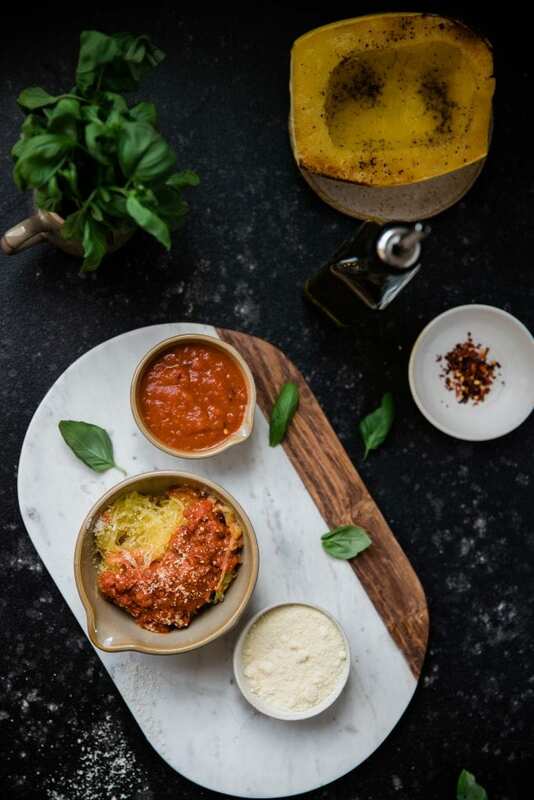 Try making your own marinara from home to have with this spaghetti squash or simply enjoy with seasonings. Preheat oven to 400 degrees F. Cut spaghetti squash in half and place flesh side up. 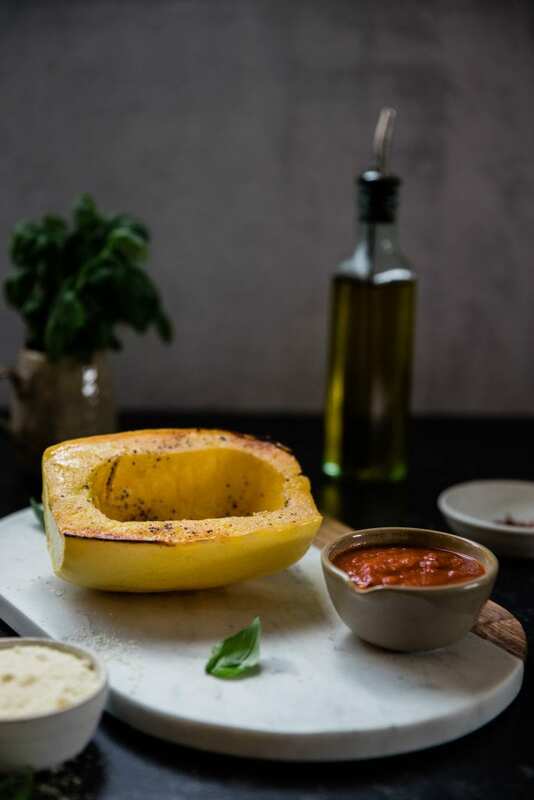 Lather the olive oil on the insides of the squash and sprinkle with garlic powder and pepper on it as well. Place the 2 halves faced down on a baking sheet lined with foil. Bake for 40 minutes, or until inside is tender. You should be able to run a fork through the flesh easily. While the squash is cooking, heat up your sauce in a small saucepan on the stove. Add in the basil, garlic, and oregano. I like adding more herbs to my jarred red sauce - if your sauce already has great flavor then don't worry about adding anything! Serve spaghetti squash in a bowl or plate and top with sauce, enjoy! PIN THIS SIMPLE SPAGHETTI SQUASH FOR LATER! Such a great sub for the carbs in pasta! What a great meatless dinner! It’s such a great go to! Thank you! I really need to try this! I have always seen recipes for spaghetti squash but never tried it. This is a really handy guide for someone like me who doesn’t know where to start with this squash! Thank you Michelle! It really is simple to make once you get past the cutting it in half part!! hehe. I hope you love it! This spaghetti squash looks soooo delicious. Can’t wait to try it. Thank you so much Kate I hope you enjoy!! I love the directions for making spaghetti squash in the Instant Pot. If I was really on the ball I’d plan to make one every week and keep it for the nights that I make pasta for my kids. Having this around makes it so easy to be low carb! And I love the taste! Yes – the Instant Pot makes it so easy to prep!! I would love to re-create this keto friendly pasta. 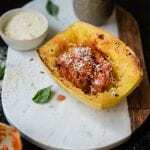 I just started doing a Keto diet and this spaghetti squash is on the top list menu this week. Thanks for sharing. You are so welcome! Watch out for how much marinara you use and which kind since some are very high in sugar. I recommend to make your own from scratch 🙂 Thank you, enjoy! !